The following ten essays are each roughly a thousand words each. They recount my trips down the North Fork of the Flathead River in July of 2009. Because the river crosses the U.S. Canadian border and U.S. border official ignored my phone calls, I divided the trip into two parts. The first was a bike and pack raft adventure. We dropped off pack rafts as high on the river as we could, drove to the border in my truck, then biked back to the rafts, and finally floated back to the truck. For our last night in the valley, we biked to the top of the mountain that the Cline Mining Corporation planned to turn into a mountain top removal mine. 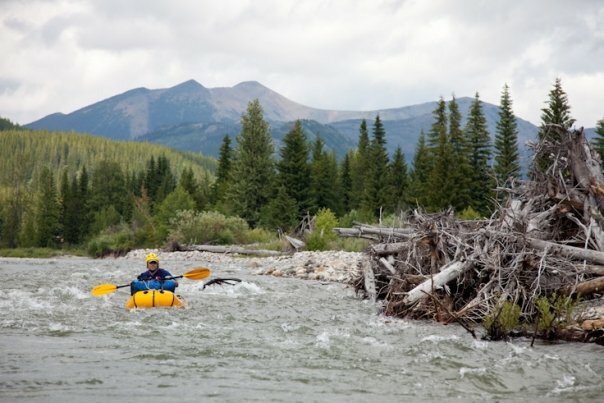 A week later, I returned for a more traditional canoe trip down the remaining 55 miles of river that flow from the border to the confluence with the Middle Fork of the Flathead River. Both were clearly amazing trips. We were going to leave at one in the afternoon. Aaron calls at 12:30. He needs more time. He calls again at 3:00. Still more time. He calls at 4:30. Come over to my house he says, I’ll be there shortly and we’ll load up. Five-thirty finds me still waiting in his living room, small talking with his wife and boys. By 6:30, we’re on the road, fresh pepperoni pizza steaming up the cab. Black hot asphalt spills by as we speed north. We stop in Whitefish – he needs a head light the Princeton Tec sales rep had stashed under a car at the community center. We stop in Eureka for gas and coffee. The border agent at Rooseville waves us through with a friendly pass of his hand. At the 3 and 93 Dairy Bar, we blast east towards Fernie. Finally, by 10:00 we turn off the highway, trading smooth, windows up pavement for shuddering, open aired dirt. We miss the turn, but find it after doubling back. The dark is disorienting and the map’s scale too big. The road proves rougher and longer then either of us remembered. My back hurts and my sides are sore from sitting for hours. The darkness surrounds the truck, impenetrable. We stop to pee and the feeling of constant motion confuses our suddenly still bodies. We wobble and waver like drunks. A half hour after midnight we stop and find a place to pitch the tents. My dry, strained eyes dance, finally free of contact lenses. The air is cold and wet, the grass slick with dew in the soft moonlight. Silence, too big and too soon, goads us into exchanging silly, road-baked phrases. We both read in the blue light of head lamps, too weary for sleep. We are looking for a road that doesn’t exist. The old-timer in the grey Ford says so. We have no choice but to believe him. Twelve noon, the second day: Our fourth pass on this stretch of road in search of what we’ll never find. We improvise a Plan B. We’ll take another road, the day after we finish paddling, ride up that and camp for the night on the mountain of coal. It’s ok. We reassure ourselves. We’ll still get the basic feel, even if the aesthetics aren’t perfect. We’ll achieve our goal. Two pm. We pull into yet another two-track. Maybe this one leads to the river. It does and to an outfitter’s cabin too. No one’s home, I use their outhouse, happy to save some of my toilet paper. Thanks. We walk to the river’s edge and assess. It seems deep enough to float. We chat some more, building our confidence through mutual agreement and open the back of the truck. Gear spills out, bikes, trailers, dry bags with clothes, food, tents. A rainbow of gear. We stash the boats and paddling gear in the woods. We’ll be back here in two days, after we ride the 35 miles back from the border. We’ll trade the bikes for the boats and float the river back to the truck. Five days total. Then we’ll spend our last night on top of the mountain of coal, riding our bikes four thousand and five hundred vertical feet up a twisting dirt two-track to the summit of the mountain they want to raze for its bituminous treasure. We bounce down the road towards the border and the start of the adventure. Fifteen miles, twenty five, thirty. The going is slow, I keep the truck in second gear and we stay well below 25 miles an hour, catching occasional glimpses of the river and the surrounding mountains. Eventually, we crest a long hill, just a few miles from the border, and we decide to stash the camping gear and trailers in the woods, at the top. We’re so clever, we congratulate ourselves. Now we won’t have to ride with all the gear back up this hill and we’ll get a little warm up before hitching up the trailers. Finally, the border! An old hunting cabin sits ¼ mile from the swath – a massive 200 yard wide clear-cut that stretches the entire length of the U.S.-Canadian Border. We park near it, past the sign warning us of the washed out road. We slip into riding shorts and click our helmets tight. The climb to the stashed trailers is mellow. We chat in easy conversation, elated to be biking after two days of driving. We still have hours of daylight and are feeling strong. Aaron’s bike wheels are too big for the trailer. He can’t make it work no matter how hard he tries. He swears and berates himself for such an obvious mistake. Twenty-nine inch tires don’t work with trailers made for 26 inch tires. We load as much gear into the trailer mounted to my bike as will fit and stuff the rest into my backpack. Extra food, a bulky camera lens, an extra sweater, my camp shoes are all jettisoned, victims of too little space. They’re stuffed into a dry bag and hidden with the unusable trailer deep in the woods. We mark the spot with a big rock just off the road. I ride Aaron’s bike, wearing my backpack, and he rides mine, towing the trailer. He insists. Though it’s nearly 7:00 at night, the still high summer sun casts shadows through the trees. The kilometers spin past. Each is marked on these roads, and we watch for them, friendly reminders of the ride’s inevitable end. We spend the night by the river, finally stopping at 9:30. We build a small fire and watch the mountains fade from green to blue to black as nighthawks dart through the darkening sky. Oh to see the world from the stern of an Old Town, a Mad River, a Wenonah, a Bell; yes, a happy man would I be. Weighing almost seventy pounds and measuring sixteen-and-a-half feet, my Wenonah Spirit II is forest green. Black vinyl gunwales run the length of each side, providing rigidity and shape to the graceful curve of the canoe. Three wooden thwarts stretch across the opening. 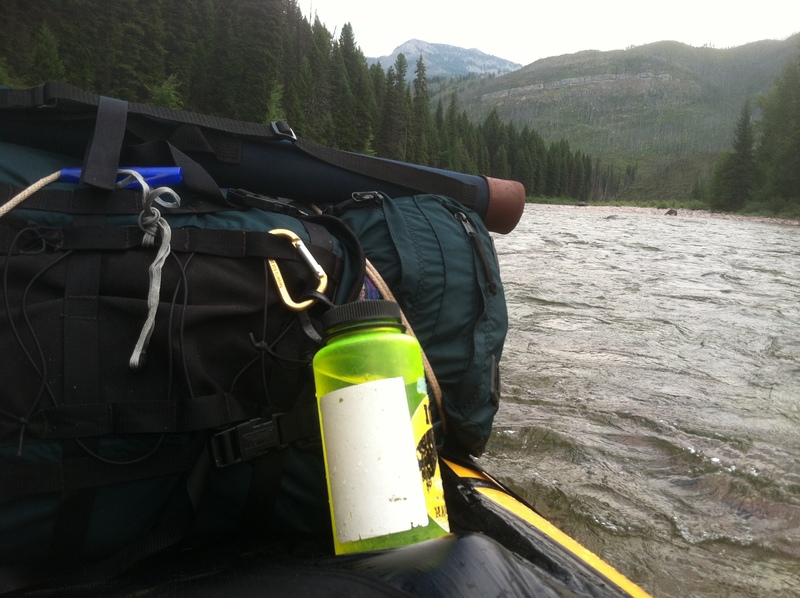 A week’s worth of gear peeks over the gunwales. Splashes of bright blue, yellow, red, and green contrast with the light grey of the canoe’s interior. Steering a canoe down a river is difficult. 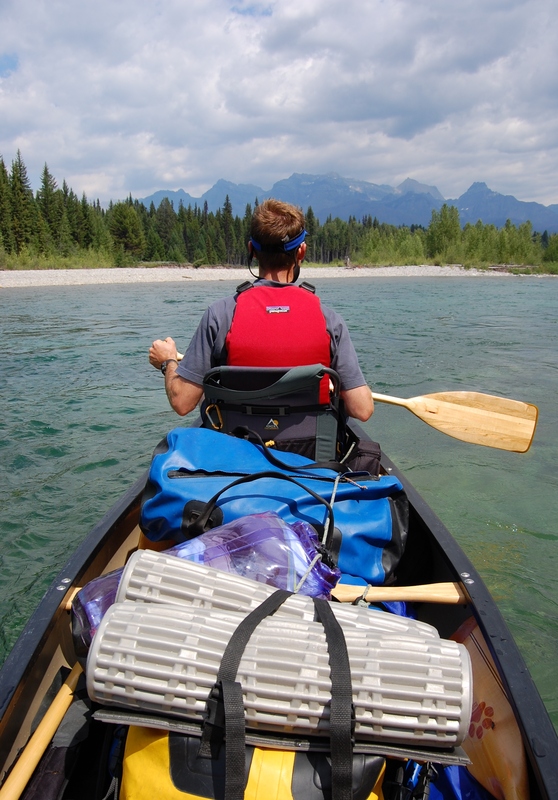 Unlike rubber rafts or nimble kayaks, canoes require perfect positioning and constant communication. Finding the smoothest water, the line to run, is an art that requires practice, skill, and confidence. Sliding through rough water, bow pointed straight and true, is grace itself. The present becomes the only. All thoughts of past, of future, of family, of everything but the paddle and the canoe and the water disappear in the flow. This is why I canoe. The J Stroke – Back straight, arms extended, drop the blade into the wet. Push your top hand forward and pull the bottom hand back. Keep the blade as vertical as possible. When you reach the end of the stroke, rotate the knuckles of your top hand forward towards the surface of water and pull back slightly toward your waist while holding the paddle firmly. The blade, now sideways in the water, pushes back and the boat straightens. Slide the blade out, lift forward, rotating the paddle again so the blade enters the water vertically and repeat. Ten thousand times repeat. The Brace – Back straight, arms extended, lean out to the side and flatten the blade against the surface of the water, push with your bottom hand. Grab the current with the paddle and hold the boat steady. The Draw – Extend the paddle out into the water, blade parallel to the sides of the boat. Pull towards the boat with your bottom hand, and it will slide sideways through the water in the direction of the paddle blade. Archeologists have discovered a dug-out canoe they believe is 8,000 years old. For eight millennia, humans have been taking that one-way trip seaward, slipping into the current, paddles in hand. Eight thousand years of exploration and of the unknown that lies beyond the next bend; eight millennia of Caribs, and Abenakis, of Penobscots and French voyageurs, of tinkering with just one basic design. The fire hisses and pops while Jason and I relive another day of our adventure. We laugh and shake our heads at the near misses, the repeated bailings, the elation that somehow we escaped the cold clutch of the river. I tell him about the archeological discovery, and we try to span the time with our minds, while the fire casts dancing shadows on the latest example of what those scientists found buried for so long. As the night deepens and our talk wanes, I can’t help but wonder just how many such conversations in how many strange tongues have melted into the river’s voice since we first dipped a paddle into the current? One winter, my last of high school, I spent my afternoons and weekends at a neighbor’s, shaping and gluing eighteen-foot-long and one-inch-wide cedar strips to a frame. I had quit the swim team and needed something to do. The neighbor had a shop and was patient. I figured I’d sell it when I was finished. But with each successive layer, a small, pretty canoe took shape. I sanded it smooth, fiberglassed the inside and outside, painted it blue, and came to love it, even if it wasn’t the sailboat I dreamed of. The next summer, my brother and I took my canoe and one he rented on a well-known float in Western Maine. We paddled across two lakes, down a river to the first lake and then back to the car. We brought cold beers, steaks, camp chairs and played Frisbee in the soft evening light. Backpacking it was not. Years later, when I again caught up with my canoe, and took it on my first western river, I crashed it into a rock just three minutes from my put in. The boat splintered beyond repair. I shouldered it back to the truck and hated myself for wrecking it. Half of it now stands vertically in my office, a bookshelf full of field guides and old photo albums. I proposed to my wife after paddling an ancient, broken Old Town six miles across Kintla Lake in the northwest corner of Glacier Park. The next spring, her folks bought us a brand new Wenonah for our wedding present. We honeymooned for five days on the Green River in Utah, floating through the impossibly beautiful, redrock canyons. Now our weekends drift by, watching osprey and trout on the Bitterroot, the Blackfoot, the Clark Fork; we haven’t backpacked in two years. I keep a list of the next big trip, and it grows with each passing winter: the Missouri, the Yellowstone, the San Juan, the Colorado. Eastern rivers too: the Allagash in Northern Maine, the Androscoggin that flows past my home town, the Kennebec, the Dead. The North Fork was my first real river. The first time I ran rapids big enough to cause fear, the first time I camped on a river in the West that is my new home. This great, glacial green river that drains the wildest valley is my river. The rapids, the cobbles, the sweeping views stretching for miles, speak to me like no other place can. The North Fork is my birth river, even though I took my first breath three thousand miles from its rugged shores. Yes, the North Fork is my dream, my reality, the place I go when I am trapped by life. The North Fork and a canoe. Oh a happy man I am. I stepped nervously into the boat. It was only my second time in an Alpaca Raft, and I struggled to squeeze my feet into the pinched bow. Cold, gray clouds shrouded the mountains. I waited, anxious in my boat while Aaron repacked yet again, trying desperately to fit his camping and camera gear into the tiny craft. A violent thunderstorm had cracked us awake at 3 am. Hours later, we had dried gear in a few rays of morning sunshine, but the clouds gelled again as we packed for the three-day trip downriver. The boat’s diminutive size made things difficult and while we struggled with our gear, the first raindrops fell. Twenty minutes later, water dripped from the soaked brim of my hat. Only five minutes downstream, and we were back out of the rafts, stumbling on the slippery cobble, the boats heavy with gear, swinging in the current. It was too shallow. We’d put in too high on the river, too late in the season. Icy water, snow melt still in July, clawed through the neoprene socks I wore under my river sandals, strangling the feeling in my feet. I slipped again, lurching to the right and plunging my leg deeper to stay upright. Splashing forward towards the smooth tongue of deep water, I plopped back into the boat. Frigid water, trapped by the tight elastic cuff of my rain pants, slid down my thighs and pooled at my crotch. Stumble, slip, stumble, slip. Both in and out of the boats we labored down the creek. Numb feet failed to steady our shivering bodies. We took breaks on the shore, doing pushup and jumping jacks on the sodden ground. But the driving rain robbed us of any benefits from our lurching calisthenics. Every few breaks, we’d turn the boats upside down and empty them of water. The narrow river valley provided no respite from the steady rain. Stunted spruce and larch trees crowded the banks and trapped the mist. Green of every hue crept up the steep valley side. Red roots, exposed on the cutbanks, glistened and shuddered in the rain. Grey and brown swallows and skimmers darted through the streaks of wet, catching flies. Rain drops crashed into the creek, ripples lost to infinite others. The cold faded into wet, the wet back into cold, and we drifted on. Damp jerky stashed in the pocket of my life vest gave my mouth and mind something to savor while the wet consumed me. I drifted ahead, catching more current and less eddy then Aaron. The weather commanded silence, all words lost to the river and the rain. My boat spun in the drift while mist and drizzle mixed with rain. The day before, on our bike ride up the road paralleling river, we had scouted a campground nested in spruce trees big enough for shelter should we need it. It became our mantra and we struggled towards it. Time folded onto itself as it does when the distance to a destination is unknown. My thoughts became fluid like the water beneath our boats. Invented futures and rewritten histories bobbed together on the rippled surface of my mind. Grand plans and crushing defeats inflated and deflated me. Lost in thought and prisoner of the present, I kept one desperate eye watching for the grey slab of rock that announced the campground and the promise of respite. When you’re in them, rivers seem to have infinite bends. Each curve and twist promises yet another. They confound maps and GPS and force you to wait and wait. Like life itself, rivers never reveal their next move. If you paddle until your hands ache and your arms burn, you never go much faster than the river goes. So we sat in our tiny boats, cramped and wet, water pooled to our waists, and we drifted past the world, at once a part of it, and yet always moving on. Of course we found the campground. We cheered and hollered, breaking the quiet of the valley. We jogged and jumping jacked. 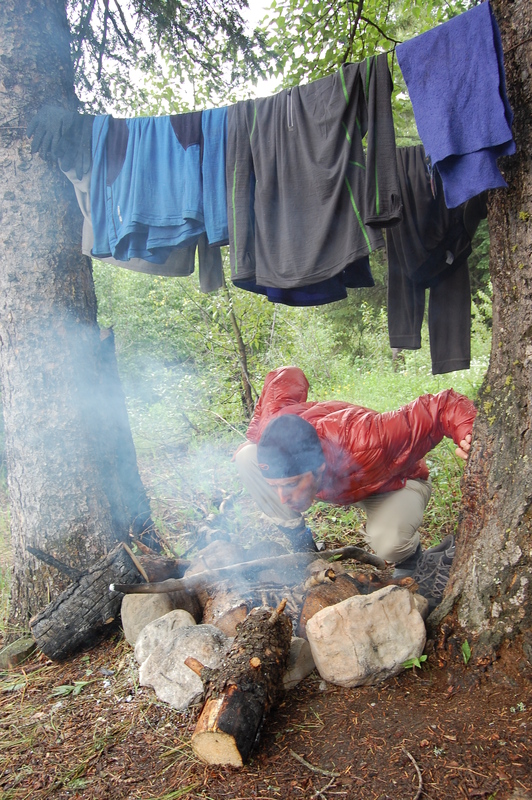 We found damp wood and built a fire under the two biggest spruce trees we could find. We piled twigs and leaves dug from beneath the wet duff and burnt our thumbs on the lighter. It smoldered and died. We tore up notebook paper, we scraped pitch from the pine trees, and we doused it all with alcohol from our camp stove. It caught and we blew on it until our lungs were raw and the smell of smoke soaked deep into our tired muscles. All the while, rain drops played a symphony in the forest. Smack on our hoods. Splish in the creek. Foosh through the trees. Hiss on the flames. In an hour-and-a-half we had a decent blaze. The rain, perhaps affronted by our modest success, redoubled and streaked the air. We huddled over the fire and melted holes in our pants and jackets when bright orange embers jumped from the ring. The white-grey light stayed constant, the sun’s movement imperceptible behind the thick cream-of-mushroom clouds. Another hour, maybe two, slipped by as we stood, spinning slowly on an invisible spit near the orange flames, drying our front while our backs sponged in the rain. We boiled water on the coals to make up for the fuel we’d spent getting the fire lit. Dehydrated soup, Turkey Tetrazzini, some more jerky. The warm food seemed to brighten the sky. The rain lessened and we scrambled to set up tents before it returned. Dry clothes and warmth seduced us to bed long before dark. Slipping into a dry sleeping bag while rain sings on the tight fabric of a tent is the only antidote to a rain soaked day that heals. Fires help, but ultimately fall short; so too does food. Warm and dry for the first time in a dozen hours, tomorrow seemed far away as we lay in our tents, speaking softly to each other across the campground. Irregular thumps of rain splattered above my head, and the day drifted away on the river’s rising waters. I huddle over my handlebars and pump my legs. Up down, up down, the rhythm dominates my present. I breathe heaving gulps of air. We’ve been riding hard for a couple of hours, climbing up the unnamed peak that the Cline Mining Corporation plans to “remove.” We call it Foisey Mountain because it shapes the headwaters of Foisey Creek, which runs just a few short miles before forming the Flathead River. We are headed for the saddle and then higher – to the summit if we can find a bikable route. The road is rough and seems to switch back again and again, serpentining up the slope. I keep my bike in the lowest gear and struggle to keep up with Aaron. “Oh thank God,” I wheeze, dropping my pack to the ground and unclipping my helmet. Aaron waits patiently for me at yet another switchback. “Check this out.” He points to the road cut. Sandwiched between the grey and brown rock is a thick ribbon of black. It shines dull and jagged in the mid day sun. Aaron wants some photos with me on my bike and the coal seam in the foreground. I push my bike up the steep slope, ride down on his cue, and push up again for another round. A model’s work is never done. Even a tired, thirsty, stinky, dirty model. Photos captured, we ride on towards the saddle. This seam, part of the giant Crowsnest coalfield that extends from Alberta through British Columbia, symbolizes in dark, hard reality, the desire of British Columbia’s extractive industries to exploit the Flathead Valley. In the 1970’s and 1980’s a Canadian mining company sought to develop the southern extremity of the Crowsnest field with two open pit coal mines along Cabin Creek, a tributary of the Flathead just six miles north of the American Border. Officials from Glacier National Park, concerned with the mine’s proximity to the park, convinced the State Department to invoke the Boundary Waters Treaty of 1909. The International Joint Commission created a scientific review committee to investigate the proposal and determined that the mine “as presently defined and understood not be approved.” Although the recommendation was non-binding, the mining company let its provincial permit lapse and the mine was never developed. It was 1988. At the saddle, we see the boxes of core samples. Dated 2005, the six-foot-long, thin rectangular boxes sit bleaching in the sun. A few of them are opened, and we lift the broken pieces out of their boxes. About three inches in diameter, the cores are perfectly round but jagged and irregular where they’ve broken apart. They’re both surprisingly light and yet dense and weighty at the same time. We handle them a few moments before putting them back into the boxes and snapping some photographs. In 2005, Cline Mining Corporation, a global mining conglomerate, filed a permit for a small mine, which would escape an in-depth environmental assessment according to British Columbia provincial law. Shortly thereafter, the company amended its proposal to expand the size and scope of the mine, determining that a mountain top removal mine would reap the largest financial rewards for its investors. The shift triggered an environmental review which has yet to be released. The company’s website estimates that the mountain top removal mine would produce between two and three million tons of coal annually. The resource is to be developed over a twenty-year period. Twenty years of belching diesel coal trucks pounding up and down the dusty dirt roads that follow the valley’s bottom. Twenty years of plowing deep channels though the winter snows, twenty years of moose, elk, and deer collisions, twenty years of dead Grizzly bears and wolves, killed for getting too close to white people who, for the first time in a generation, live permanently in this place. We find a route to the summit. Ironically, the very mining company whose plans we protest has provided us a way to pedal mountain bikes to the top of this ridge. Pumping up the last climb, my legs scream for mercy. The rough track from saddle to the summit is strewn with rocks and logs and the riding is technical and challenging. Finally, seven hours from the truck and 4500 feet higher, we’ve ridden as far as we can – a low point between the two peaks of the mountain. We dismount and are enveloped by the view. To the east, jagged peaks rise from a dark green forest to knife ridges of exposed granite – Waterton National Park. To the south, the north and the west, more mountains rise and fall in a sea of cresting ridges. We can see hundreds of miles in each direction – mountains and forests sinking into the curve of the earth. A carpet of jagged coal covers the low-point where we stand. Elk tracks, a desiccated leather glove, wild strawberry plants add relief – shadow and color – to the monotone. Thrilled though we are to be on top of the mountain, to have earned the right to comment and to know with our muscles and our lungs, there is a feeling of conflict here. As the machines of bureaucracy grind through the permitting, the appealing, the amendments, the injunctions, the mountain stands mute and vulnerable. We hike each peak, cooking dinner on the northernmost and watching the sun drip behind the mountains. 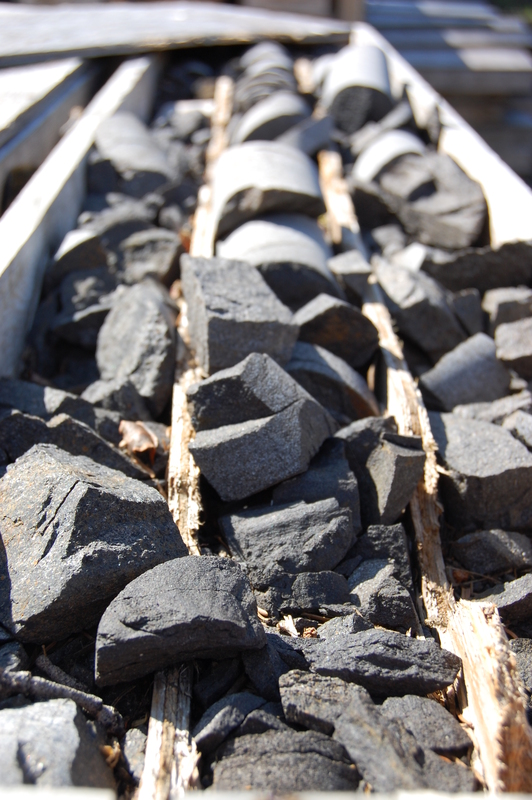 Another exposed coal seam stripes the southern flank. The sunset is an ever-changing dance of orange, purple, grey, blue, and gold. Alpenglow burns the tops of the grey crags. Finally, in an instant that has lasted for hours, darkness crowns the peaks, and the first planet bursts into view low in the southern sky. We sit silently, listening to the earth. Exhausted but satisfied, we force ourselves to switch on our headlamps, piercing the night with the industrial blue of Light Emitting Diodes. We scramble down the peak to the bikes and the tents. We agree to be up early in the morning and call our goodnights. Fifteen, maybe twenty minutes, slip by in the otherworld between awake and asleep. A mournful howl echoes in the valley. My eyes snap open. An answering call floats from below. The wolves are out tonight. The tent is pitched and dinner simmers on the camp stove. A small pillar of smoke rises from the burning fire, shifting and twisting into the evening sky. Gentle light bathes the river as shadows lengthen on the surrounding hillsides. The soft roar of a creek entering a hundred yards upstream adds a subtle backbeat to the song birds calling the coming of night. After dinner, I set up my camera and tripod. To the west, grey white trees reach leafless and stark into the darkening sky. Bright, succulent green grasses and shrubs cover the ground. Roses bloom pink against the green. Burned dead in a fire that covered much of the southern end of this valley, the trees shift in the evening breeze. Their lifeless forms contrast the lushness of the green earth and indigo sky. Black and scorched at their base, they rise grey-white to the sky, offset by color and shape from the landscape they helped form. I clip the camera into the tripod and squint through the view finder. In August of 2001, a huge fire spread across this part of the valley. Started by lightning high on the hillsides, the fire consumed acres and acres of trees. Reaching to the river’s edge and at times jumping across, the fire reduced the lodge pole forests to jumbles of toppled snags. Cottonwoods too, fell victim to the lapping flames and died, rooted firmly in place. Their skeletal branches still reach for the sun, denuded of leaves, cold reminders of what once was. Fire crews battled the Moose Creek blaze for three months as it burned 71,000 acres of Flathead National Forest. Beginning with the August 14th detection, crews responded to twenty-eight separate fires in the next four days. Skies across the valley reeked of smoke and ash. Historically high drought conditions helped the fires as they spread and intensified. Hot, windy conditions added yet another layer of danger and complexity to the blaze. Fires are, of course, a natural part of the ecosystem in the West. Ponderosa pines, larch, and Douglas fir have thick bark that protects them from occasional, low intensity fires that tear through the understory. Lodgepole pines produce cones which are encased in a hard resin that melts only in fire, releasing seeds onto the blackened earth. Eighty years later, at the end of their life cycle, the lodgepoles topple and provide nourishment to the Douglas fir and spruce that have sprouted and grown in their shade. In the newly opened forests, sunlight finds its way to the ponderosa and larch seeds that lie in wait for the radiating energy to pull them from their sleep. Certain woodpeckers live only in fire-killed trees, deer, elk, and moose browse the regrowth that sprouts abundantly on the sunlit ground. 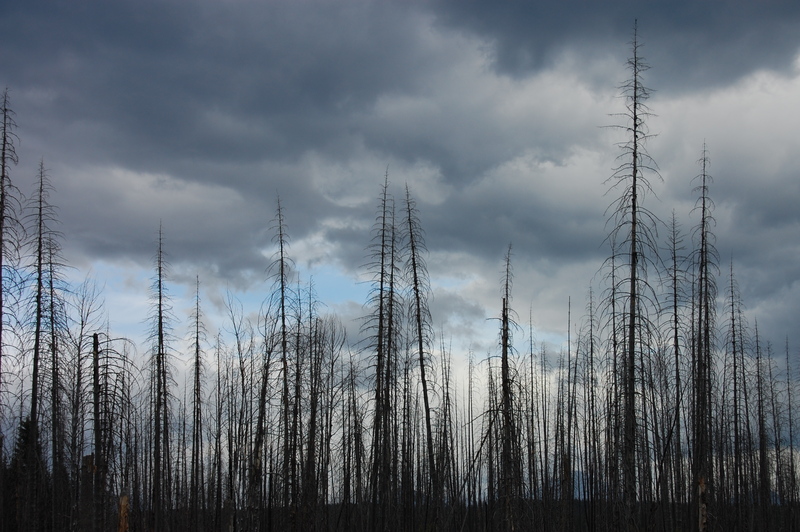 Without fire, we are realizing, forests cannot last the centuries we expect them to. I fiddle with the camera, adjusting the exposure and reframing the scene again and again. The verticality of trees contrasts beautifully with the horizontal green of the earth. The sky looks colored by hand and the green earth adds kodachrome to the black and white of the trees. The failing light makes the tripod essential, and I adjust the height of the camera to capture a different scene. At my back, just on the edge of the river, the camp fire smolders, and I hear Jason sawing more wood to add to the blaze. The Moose Creek fire threatened homes and livelihoods. Residents fled, fearful and upset by the natural spectacle that threatened their very existence. They berated the Forest Service for not doing enough to protect homes and businesses built on the private edges of public lands. Fire crews worked heroic hours, days, weeks, months to contain the fires and protect private property without needlessly endangering their own lives. Yet this fire pales in comparison to history. Responding mostly to drought conditions, like those present when the Moose Fire grew, fires in the early part of the 20th century were huge and truly catastrophic. In 1910, a massive fire swept across the Flathead Valley in days, consuming hundreds of thousands of acres. Again in 1929, the Halfmoon Fire ravaged the valley, burning another hundred thousand acres in just days. By the start of the 1930’s fires had reduced almost 40% of the valley to skeletal remnants of once verdant forests. Yet even these amazing burns seem inconsequential to the fire season of 1889, when millions of acres from Jasper and Banff, Canada, to Idaho and Montana burned. The photographs turn out nicely. The forests, too, will turn out just fine. Composing and recomposing themselves in the infinity that is time, they turn water, hard rocky soil, and sunlight into sugar, wood, and oxygen. Fire returns them to the hard rocky soil, and water and sunlight draw them forth again. An old growth forest is as much a moment in time as a photograph. Neither are the truth and the only. Fires will worsen before they improve. The earth is getting hotter, drier, more flammable. Forests will disappear in firestorms of unimaginably hot winds and exploding crowns. They will regrow and disappear again; they will stand, black and grey against the green, skeletal promises of what was and what will be. Firefighters will die and houses will disappear into dirt grey smoke. Residents will complain. They will decry the loss of timber, of good wood, just left there to burn. They will confuse the science and misread the reports, and they will accuse the Forest Service of playing lap-dog to environmentalists and technocrats. They will demand more protection for their homes, greater efforts and bigger expenditures, while decrying government interference in their lives and ignoring brochures and pamphlets asking them to keep their yards free of woody debris and their private forests thinned. Their anger and resentment will smolder and smoke like the lightning-caused fires high on the hillside above their homes, flaring up when the hot winds blow and the trees burn. For days we paddle through the burn. It is beautiful and awful. It is immense and insignificant. It is this place like the river is, like the bears and the elk we scope on the open hillsides. Like the photographs I bring home, it is a moment. I jammed the paddle into the water, backstroking hard with my right hand. The raft swung immediately to the left. Shifting, I pushed hard against the flow with my left hand and slowed to a stop in the current. Each backstroke stopped my movement with the current, and I hovered in place on the moving water. The dead tree covered the width of the river. Branches, stripped of needles and bark, shuddered erratically in the clear water. An enormous root system anchored with river rocks jammed into its twisted cavities held the tree firmly in place. I spun the raft and forward ferried to the cobbled shore. Trees line this valley. Their dark green canopies color the sides of the rising mountains. Victims of chance, they grow from the rocky alpine meadows to the very edge of the high water mark, like one mute, imperturbable organism. Spruce, fir, cottonwood, larch, alder, rocky mountain maple, each fill a void, each struggle against the other to find an extra bit of sun. Inevitably, some reach too far and gravity joins forces with the spring floods to pull them down into the river. In the crushing grey of run-off they bob in the current until they pile upon each other – pick up sticks for giants. Some get snagged on each side of the river, anchored by rocks, sediment, other trees and they strain the current. Water scours under them, pooling downriver and upriver. Gnarled branches tremble in the water, cold inanimate claws reaching and grabbing for anything the water may carry. Roman Dial, the author of Packrafting!, the book that Aaron lent me prior to our trip, tells a frightening story: He’s pack rafting a frigid Alaskan river. The current overwhelms him, and he gets pinned under a strainer. Upside down, strapped into his boat, water in his nose, his ears, his mouth, he grabs at his knife and plunges it into the rubber tubes. The sudden deflation lodges him loose and he wrestles free. Shivering on the bank, he patches his boat and returns to the river. Standing and stretching on the bank, I wait for Aaron. It’s the fourth portage today, so I’m in no hurry to heft the raft and gear around the tree. Like us, the fallen trees follow the fastest, deepest current until they get hung up, piling on the shore and the outside bends of the river. As we ride each turn, we’re careful to keep away from them and cheat to the inside where it’s shallower and slower. Most show signs of beavers. Huge cottonwoods, three or four feet across, are whittled slowly by the massive rodents, toppling under their own weight and crashing into the river. Fires, too, kill trees. There’s a lookout tower just south of us on the border. Winter’s ice and snow crack limbs and freeze sap. Insects – bark beetles mostly – are plaguing giant swaths of forests, reducing them to orange needled dynamite. This valley seems largely free of the massive beetle kill farther south. For now. Aaron catches up and pulls out. We chat and nibble some jerky. It feels good to stand after being squished into the boat. A breeze rustles the leaves of the cottonwoods behind us. We paddle for five minutes before another river-wide strainer stops us. The river braided a half-mile up stream and is narrower here. 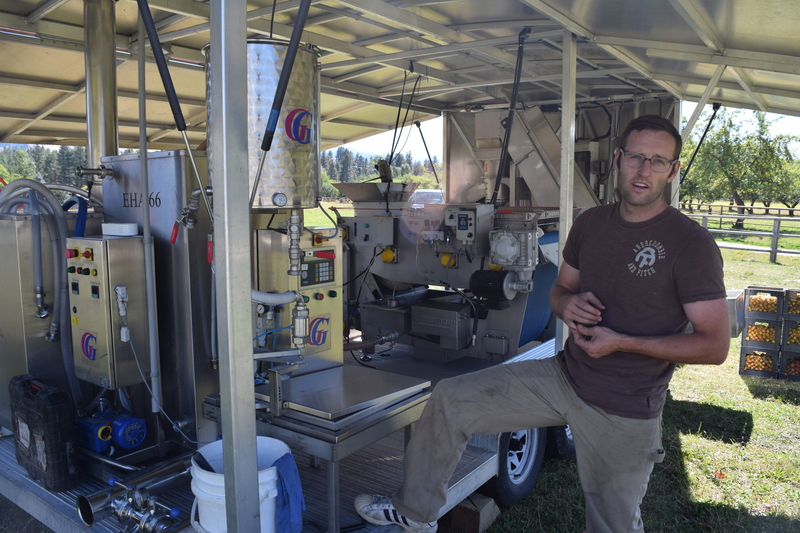 Less flow, steeper, tighter banks, more strainers. We spin and forward ferry to the shore. Stretch and heave the boats onto our shoulders. The motions are memorized now, easy and fluid. Curl one hand under the tube; grab the bag lashed to the bow with the other. Turn and lift, slipping the tube onto a shoulder. Step across the river stones and make your way. Reverse motions and drop the boat back into the shallow water downstream of the tree. Still we grumble and curse the strainers. Rivers are dynamic and strainers static. Rivers move and ripple, flow and continue. Strainers stand stoic and silent, looming, dark, wet, deadly. Their constant presence is unnerving. We follow each bend, hopeful that the way is clear, that we won’t get swept under. Could I maintain composure, grab my knife and puncture the boat, I wonder, compulsively checking that the knife’s still on my chest every few moments. We have repair kits, I have the knife; we have time to wait for the glue to dry and the nerves to settle. But do we have the skills, the calm, to execute such a critical maneuver? The evening rain shower had quit but the emergent sun held no warmth. Hungry and cold, I was annoyed we were still in the boats searching for a campsite. We’d blown past several that seemed good enough. Aaron insisted we try and find the perfect spot. Good view, cover in case of more rain, flat, preferably with a sandy spot to pitch the tents. A swallow darted in front of me, chasing flies. He’s eating his dinner, I snarled under my breath. The grey peaks shone in the evening sun, even as the valley cooled in the shadows. I scoured the banks for a campsite to match Aaron’s requirements and shivered in my still damp rain jacket. I heard the roar before I saw it. Splaying my paddle in the water, I turned to see the jumble. From my angle, low and tight to the water, I saw a log, sticks, still leaved branches shaking in the current behind a deep aqua pool of whirling water. A moment passed and the current carried me closer. I glanced across the river: grey-white bones of wood stretched the distance, no choice but to portage. Another moment passed and I floated further. I jammed my paddle into the current. The boat spun upstream and I jammed the paddle again. Again and again. The raft jumped at my requests and moved upstream against the current. I aimed to the side, diagonal now, pointing 45 degrees across the current. I dug in and gripped the paddle ferociously. “Strainer,” I screamed. “To the side, to the side! !” Aaron mimicked my manic movements and peeled out of the current. I leaned forward and drove the paddle deeper into the water, slowly inching my way to the side. I heaved and grunted, trying to maintain the 45 degrees that would get me across the current the fastest, but mostly paddling straight upstream. Water splashed my face, my arms, my legs as I spun the paddle in a whirl of motion. Finally, miraculously, I slipped out of the main current and with a final heave lurched out of the boat into calf-deep water steps from the bank. I looked up. The strainer was now twenty feet downstream of me. I looked more closely, safe now on the bank: a smallish cottonwood spanned the river dancing lazily in the current. 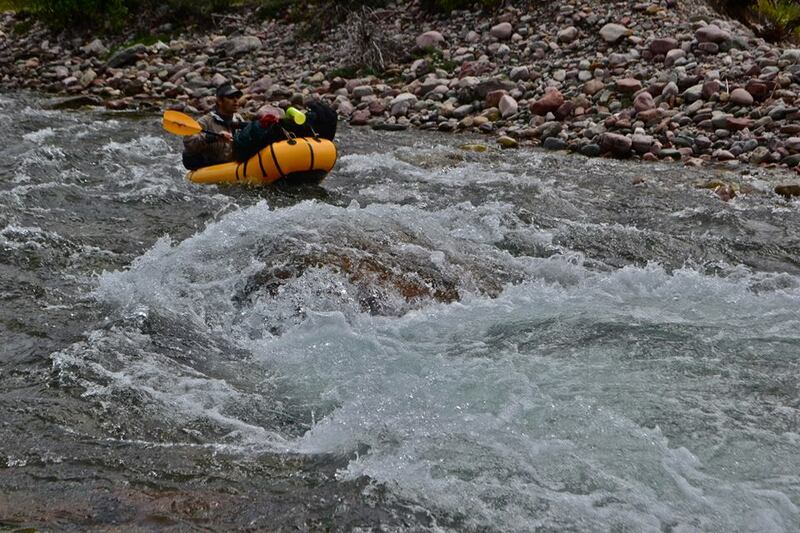 I had paddled back upstream fifteen feet in a frenzy of adrenaline and fear. The gasping hole that I felt so sure would drag me down was little more than a quiet pool of water bubbling with some swirling current. I laughed at my gross over-reaction, as Aaron dragged his boat down the bank to me. At least, I thought, I’m not hungry anymore, and I’m sure not cold. Thick black lines squiggled across the smooth blue. Rapids. For days we’d been eyeing them on the map, three sets of thick, wavy lines, compact and perpendicular to the long blue that inked the river’s route. Fool’s Hen Rapids, Class II+, the book said. Intermediate canoeists or better. Beware cold, glacial water, wave trains, and dangerous currents. We’d been reading the warnings at night, sitting by the campfire. Today was our day: We’d hit them all and either stay upright or not. No big deal we assured ourselves, we’ll be fine. Anxiety nibbled my guts. My wife’s only request bounced around my brain: Just don’t wreck the canoe. It was late July; peak flood had blown past a month ago, we reasoned. Less water meant slower current, more time to plan and maneuver, less opportunity to get hung up. But what if it was too low? Rocks that would have been avoidable two weeks ago would be exposed – dark, lurking boulders that could stop us instantly. Stuck in the flow, the canoe would swing sideways. Jason and I would scramble in the trembling craft, lurching to this side and that; water would rise over the side and in a moment that lasts a lifetime, the boat would dip under the current and wrap itself on the boulder. We’d be thrown into the roiling swirl, our gear, our paddles, our coolers and dry bags would be swept under and the boat would rock in the current until it gave way, finally sliding deformed and broken into the current. Three years before, almost to the day, I wrapped my first canoe on this very river. A wood and fiberglass beauty I had built my last year of high school, it cracked along the waterline, splintered at the rails, and filled with water. Sputtering as current overwhelmed me, I grabbed the bowline, my fly rod, and an empty beer can as they floated with me through the wave train and somehow kicked to the bank where I lay heaving and coughing. Only minutes from the put-in, I hefted the fractured boat onto my shoulders and limped back to the truck. I had unhappy history on this river. My wife was justifiably worried. We scouted the first set, picking the smoothest tongue of water from the foaming white – our line. Head straight in, between those two rocks there, kick left with a draw, and side slip past the wave train, I pointed. Those two there? Jason’s turn to point. No, those two, the one there and over there, past the other one. Sure…We piled back into the boat, hearts thumping and blasted into the current. Suddenly, everything looked the same. Was it that rock or that one? We hollered to each other, found a new line in the moment and snuck through the rock garden. We scouted the second set, walking up and down the bank making sure we picked rocks big enough that we’d know them once we were back in the boat. While the first rapid had been a rock garden – random boulders planted in the river – this one had a short, steep drop and a long wave train. Straight down the middle we agreed. Hold on like hell to the paddles and dig in hard when we hit that first wave. And we did. The bow rose up, cresting the four foot wave and slammed back down into the trough. Water cascaded over the sides, dropping the canoe lower in the current. Again we rode a wave and smashed the trough. More water spilled over the gunwales. Again and again. With each buck, we took on water. The canoe jerked from side to side, precarious and unsteady. With one hand on the paddle and one on the gunwale, we flailed towards shore. Jason jumped out too early, sinking up to his thigh in the slower current of the river’s edge. Pure athleticism and strength kept us upright as he jumped, one footed, along the slippery cobbles. We scouted the third set and felt dialed. A bend curved to a drop then to a wave train then to another bend. We disassembled it in our minds, matching each feature with a stroke. Hard forward pull there through that wave, quick right draw to kick the stern around that rock, hard pull through the next wave, and drop into the bend. Keep in the current, close to the bank and then pull, pull, pull through the turn, safe and sound. Confidently, I pushed us into the current and gripped the paddle with both hands. It felt custom carved for my hands, and I smiled and whooped, excited and ready. We didn’t scout the fourth rapid. Swaggering from nailing the third, I vetoed Jason and directed him to the left of the house sized boulder dividing the channel. Between the monstrous boulder and a smooth, steep smear of grey cliff lay a five-foot-wide strip of angry water – our line. Bouncing furiously off the boulder, the river curled in a white, foaming snarl up the cliff side and smashed back into itself, screaming stay away. A deep pool lay directly behind the boulder, and I saw a thick eddy line pinching our line closer to the cliff. Oh sweet Jesus. We crashed into the curl. Water poured over the left gunwale. I jammed my paddle in the current and the boat turned, pushing against the roiling eddy line coming in from the right. Jason dropped to his knees and paddled furiously. The boat leaned right, way right, and water spilled over the side. We lurched left and the left gunwale again submerged. I heaved my body across the top of the canoe in a last ditch effort to keep us steady. My left leg swung out of the canoe and into the current. It kicked through the cold water, somehow providing enough leverage to keep the boat upright. Jason crouched in the bow waiting for the inevitable. Waiting for the wet. Deep swirling water slowed the boat to a stop. I looked up. The boulder, the cliff, the curling threatening snarl were all upstream. To the right lay a ledge where we could bail the boat and rest. I gulp from cupped hands. Water spills from my mouth and onto the grassy stream bank. I gulp again. The water is sweet and cold. Just a few draughts more and I wet my hair. Water streams down my back and onto the ground. I yelp at the cold, but the yellow sun beats down, drying me almost instantly. I wet my head again and fill a water bottle. Survival guides claim that a person can survive for a week without food. Our bodies burn excess fat and muscle for days and days until we finally starve. Without water, however, we may last two or three days. The books detail countless methods of capturing water: from morning dew, from plants, from seeps, from holes dug in the ground and covered with plastic, even from your body’s waste expulsion system. What these books never recommend is drinking straight from creeks. Drink your urine, but don’t drink water without treating it – a tragic comedy we don’t address. Omnipresent partners in our exploits, the outdoor gear industry has developed countless purification methods. Pills, chemicals, iodine, mechanical filters, ultra violet gadgets, solar powered machines. 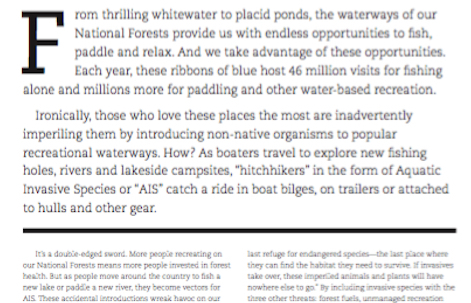 Promises of water without viruses, bacteria, protozoa, critters, and chemicals that will make you sick adorn the glossy ads in Outside, Backpacker, National Geographic Adventurer. A one-to-one ratio of these two chemicals, a few minutes pumping, ninety seconds of stirring with the Ultraviolet pen, ten drops of iodine… like pitchmen promising cleaner laundry and no hassle cooking, the advertisers seduce and we consume. Americans spend tens of thousands on water filtration systems built for hiking and biking each year. I have two such gadgets and always bring backup pills in case they break or fail. It wasn’t always so. Just a few decades ago, people drank straight from creeks in wild places. An advertisement in a Kalispell newspaper from 1975 boasts the clean, drinkable water found in the valley. A man stoops over a lake, cupping water to his lips. A century ago, people drank straight from creeks in developed places. Two hundred years ago, drinking from creeks was one of the primary ways people got water. But fear has bested tradition and now, even in capital “W” Wilderness Areas, we treat the water…too many horses, too many cows, too many people. We are all too ready and capable of conjuring images of elk and beaver defecating in the creek to risk slaking our thirst with cupped hands. Even if we’re sure that no beaver has lived in the watershed for a century, we still imagine writhing, flagellated microorganisms intent on disrupting the delicate balance that is our gastro-intestinal tract. No, no, we are told, you have to treat all water, all the time, always. The canoe bumped gently into the bank. Jason stepped out onto the cobbles and steadied the dark green craft. I followed and we pulled the boat up onto the bank. Ten feet downriver, a rivulet of water burst from the cutbank feeding a small colony of green plants. Monkey flowers, columbine, fireweed – yellow, red, pink and green spilled down the cutbank offsetting the dusky brown. We grabbed water bottles and gallon jugs from the canoe and stumbled to the cascade. The water was ice cold. It pooled beneath the outlet, and we shifted from foot to foot to maintain feeling. Raising the filled bottles to our lips we drank in long draughts, catching our breaths between each gulping session. We had waited until the last of the water in our bottles was warm and unappetizing, planning on finding such a seep. A pebble bumped the bottom of my bottle. I dumped it out and refilled again. Unneeded filters stayed buried in the bottom of a dry bag lashed to the canoe. Drinking water straight from a creek connects the drinker to millions of years of ancestors. The simple act of bending over a stream and using hands to slake thirst is so elemental, so primal, it broadens the connection from human ancestors to animals and plants. We fit into the perfection of the hydrological cycle. Water from the ocean evaporates skyward, falls as rain and snow on mountains and plains, and carves its way back to the ocean again. We sip from the same source that all life sips from. We bend, tired and sore, sweaty and salty, cotton-mouthed and thirsty beyond words, and we partake of the most magical of all nature’s doings – cupping our hot dry hands and raising clear, cool, sweet water to our lips. It is my most favorite part of being in the out-of-doors. Many Native Americans thought that water was a living being. They would insist on dumping water left overnight before rinsing their mouths of sleep’s bad taste. Refilling their gourds and bladders with fresh, living water provided them with life. This notion has been so marginalized, so driven from our modern 21st century, that we want the polar opposite of living water. We want sterilized, purified, inanimate water. We want our water bottled and passed through filters and under Ultra Violet light. We want our water dead. We stop and stretch tired legs. The day is hot and clear. Our bikes rest on the dirt track. Five miles we’ve ridden and three yet to ride. A culvert passes under the road, spilling the seep down the mountain. We clamor down the steep bank to hold our bottles under the trickle. I take a tentative sip. Cold, sweet, clean. I swallow in big, fast gulps. My head finds its way under the stream and the cold hurts wonderfully. I look around as the sun dries me. An osprey glides on a current of warm air. Dark green fir trees sprout from the mountainside. We are all connected I think, all made mostly of this magic liquid provided so freely for so long for so many. We are all entirely dependent on this unique chemical bond, all entirely at its mercy, all desperate for its infinite existence. The tracks amble across the sand. 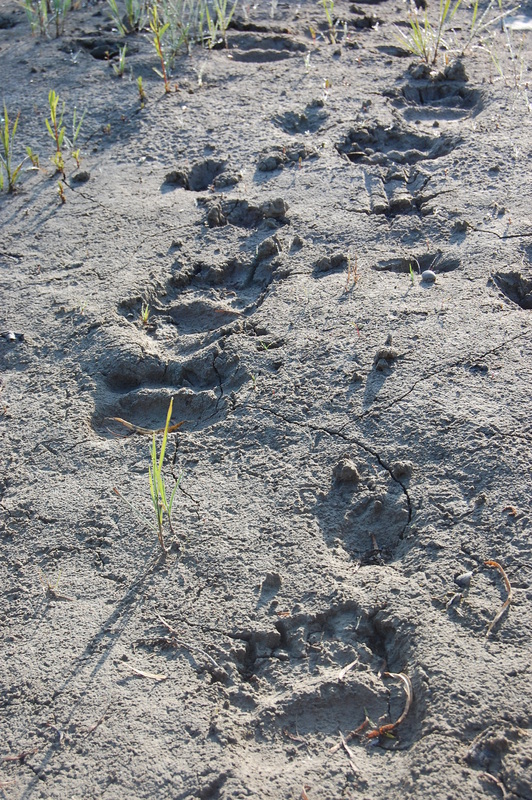 Perfect impressions of the black bear who walked here last night. Our camp is just fifty yards away. He must have known our presence. Canada goose tracks splay across the sand as well. So do squirrel and marten tracks. The night before, we watched as a thick, glistening beaver hauled out of the river and sniffed at the driftwood that lined the bank. His gnawing mark is everywhere, from the biggest, oldest cottonwoods to smallest saplings, neat bites ringing the gnarled trunks. River otters have joined us, diving and playing like dolphins in the current. Rare carnivores, otters hang on in just a fraction of their historic range. Too many people, too many docks and too much rip-rap have displaced them from the rivers they knew for millennia. But they are here. For days we watch birds. Killdeer, black stripes across a whiteish chest, dip and bounce along the shore. They are joined by spotted sandpipers, smaller and stockier on the river’s edge. Bank swallows emerge from their tiny homes, holes in the sandy cutbanks, and dart and careen through the evening. High above we scope bald eagles and ospreys. Baldies have straight wings, ospreys are bent. Vultures too, soar high and silent on the thermals, wing tips spread like fingers in the air. Brown-headed mergansers scoot across the water, playing. Entire families float the riffles, tiny bobbing juveniles behind a mother. The youngsters dive two inches below the surface, plowing through the water and leaving a wake behind. Saw-toothed bills catch and firmly hold their prey, young, slippery trout, until the ducks swallow them whole safely on the bank. Great blue herons squawk their guttural cry if we drift too close, lifting their massive bodies into the air with strong beats from spread wings. They circle above us, waiting to resume their patient fishing after we’ve left, necks curled tight to grey-blue bodies, long yellow legs trailing behind. They congregate in communal rookeries, raising generations year after year in the same place. Diminutive willow fly-catchers and northern flickers forage the bushy edges of the river, chasing bugs and singing the break of day. Our last night on the river, an owl – probably a barred owl – hooted us awake. The spine of my Peterson Field Guide to Western Birds becomes bent and broken. The pages wet from spray and smelling like smoke from evening’s fire. Grizzly bears live here too – the highest concentration in North America, south of Alaska and the Yukon where still massive salmon runs up the Yukon River support huge and numerous grizzlies. The last viable population of wolverines lives high in the perpetual snowfields to the east. Ferocious and far ranging, these mustelids are the stuff of legends and comic book characters. Lynx and bobcat share this place. Wolves slipped unseen across the border in the 1970’s, reestablishing themselves without biologists’ or government’s help in the timbered forests of the North Fork. This valley is soaked with wildness. The richest biodiversity of caddisfly, mayfly, and stonefly in North America scramble among the rounded cobble beneath the North Fork. Endangered bull trout and threatened westslope cutthroat trout haunt the aquamarine pools that punctuate the river. We glimpse white-tailed deer sipping at the river’s edge, tentative and guarded. Lumbering moose feast in the network of wetlands that stretch east of the river, and ermine and martens hide in the forests that line the bank. This rugged land is the gene factory for North America’s Rocky Mountains. Animals carry fresh DNA from their Canadian cousins across the border and spread it freely among their American brothers and sisters. This genetic swapmeet is their key to preservation. Variation is critical to perpetuating species for generations. Isolated populations can breed disease and affliction, depressing survival rates and dooming the survivors. The North Fork is unique in location and topography to facilitate this genetic mix. The Canadian Valley is unpopulated, the last remaining southern valley in Canada where no humans live permanently. The American Valley is heavily protected: Glacier National Park extends to the middle of the river, and the Flathead National Forest is designated as critical grizzly bear habitat, which reduces timber sales and road densities far below other national forests. A commitment to peaceful coexistence permeates the American Valley. The rough dirt road discourages all but the hardiest travelers and a twenty-acre-minimum subdivision requirement prevents the land from being chopped into so many small lots. No power or phone lines parallel the river, further discouraging newcomers. Still, the valley is changing. Despite the twenty-acre minimum, we spend our first day on the American North Fork paddling past cabin after cabin. Though they are small, simple, sparse structures, they impose a humanness on the valley that’s jarring. Sixteen thousand acres of private land lie in the American North Fork. The town of Polebridge is growing, if slowly. A young couple just bought the Mercantile and the cabins that stand mute in the green meadow surrounding it. The saloon hosts a music festival each summer that draws hundreds of visitors up the rutted, dusty road. For twenty years the pave or not pave debate has raged: A recently commissioned study on the effects of dust is tacked to the community message board in front of the Mercantile. For now, though, the bears and wolverines can mostly ignore the human intrusions into their place. The electric wires and phone lines that will hasten their deaths are still decades away. The road is still an unpaved, dusty rattle. The generator that powers Polebridge is turned off at 10:00 each night and the musicians in the saloon play acoustic numbers for their last set. The night sky is brilliantly unpolluted. We saw no bears, no wolves, no moose on our trip, only their footprints in the sand. It was enough. To know that they live here in concentrations unlike anywhere else in America is enough. To listen for a howl on the wind as dark settles into the valley is enough. Even with the cabins, the Mercantile, the music festival, and the recent increase in floaters slipping across the rippling surface of the river, the valley is wild. Even with detailed maps and convenient river access points, we are the visitors in this place and it is right. Intentional avoidance of modern conveniences preserves this place. But for how long will the rugged few that live here be able to stave off the inevitable? For how long will the wild dominate? For how long will we be the visitors? We float over them, tan ones, green ones, red ones. 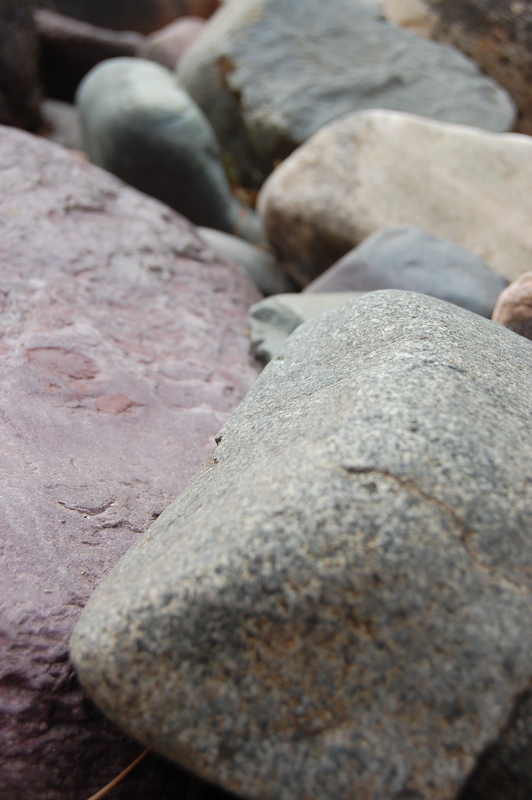 Rounded and smoothed by ten thousand years of river water, they are solid and beautiful. They are Precambrian sedimentary rocks; the oldest among them formed over a billion years ago. Ancient rains and winds moved sand, mud, and lime across what we now call North America, depositing layer after layer of sediment. For 600 million years, these sediments hardened and grew, a veneer of rock over the hard, deep basement of the North American continent, while blue-green algae split carbon dioxide into carbon and oxygen making animal life possible on this third rock from the sun. Roughly 175 million years ago, North America began shifting westward, opening the Atlantic Ocean. The continent smashed into the oceanic crust that underlaid the Pacific Ocean and the crust slipped under North America, pushing the continent upwards. For the next 85 million years, the layers of sedimentary rocks that had been deposited by the primeval winds and rains were folded like an accordion, shoved up by the floor of the Pacific Ocean. Eventually, these sedimentary slabs piled too high and slipped eastward across the continent. It was this slippage that formed the Rocky Mountains, starting roughly 90 million years ago. For 20 million years, these massive slabs each several thousand feet thick, slipped eastward, while dinosaurs lumbered across the continent, finally grinding to a halt where the Front Range of the Rockies lies today. To the east of where they settled, lay a giant inland sea that swelled and shrunk as climate shifts provided more rain or less. Eventually the dinosaurs died and the inland sea retreated for good about 65 million years ago, leaving the Great Plains fenced by the Rockies to the west and the Appalachians to the east. It is these sedimentary rocks, formed hundreds of millions of years before dinosaurs hunted and foraged through Montana that we float past and over. Called the Belt Formation by geologists, they are mudstone, limestone, and sandstone. They are devoid of animal fossils because there were no animals when they formed. Instead, they contain blue-green algae fossils, and records of rain storms, ancient streams, and sun-cracked mud. But it is their colors that fascinate me. The tan cobbles are the oldest. Made of Altyn limestone, they are flecked with grains of sand. Appearing white when freshly cut, these rocks weather to a warm tan. Next oldest are the rocks of the Appekunny Formation. These gorgeous green stones are my favorite. Given their color by silicate minerals that contain iron in a reduced ferrous state, they glisten spectacularly in the late July sun. Geologists believe that ancient rains falling through an atmosphere laden with carbon dioxide were acidic enough to keep the iron in its reduced state and therefore green or dark grey as these rocks sometimes are. Next is the Grinnell Formation and these beautiful, barn-red rocks seem purposefully crafted to contrast with the greens and tans. Oxidized iron gives them their color and some boast a thin layer of snow-white sandstone that also seems intentionally placed for effect. Both the green Appekunny rocks and the red Grinnell rocks are mudstone, and they’re made from the same minerals. Their delightful contrasts are a simple function of oxygen levels which turn iron into rust. These colorful rocks display ripples and mudcracks, remnants of ancient lakes and droughts. These two formations, the Appekunny and Grinnell, measure 3500 and 2500 feet thick respectively. As they meet, they blend in an alternating mosaic of red and green layers several hundred feet tall. Smoothed and jumbled on the bed of the river, these rocks are as aesthetically intriguing and as fun to watch as the majestic peaks from where they came. We spend days with our eyes turned down, peering through the ripples and the pools, watching the colors and shapes. On shore, we toss palm-sized cobbles from hand to hand and stash our favorites in a dry bag to bring home as mementos from this place. But the valley’s story does not end with minerals, mudstone, or limestone. It does not end 65 million years ago when the dinosaurs died and the thick slabs of sedimentary rocks halted their grinding migration. The valley’s story is both ancient and fresh, and if it ends at all, it ends with ice. If primeval winds and rains gave the North Fork rocks their color, sheets of ice thousands of feet thick gave the North Fork its shape. The Bull Lake Ice Age started 130,000 years ago and lasted for 60,000 years. Snows accumulated, hardened to ice, and started to slide. The great slabs of sedimentary rocks that had been the Rocky Mountains for so many millions of years were now capped by massive ice sheets which scoured and shaped them. During the peak of the glaciation, the ice covered all of Glacier in a continuous ice sheet, its highest peaks the only stony outcrops in the great white sea. Glaciers stretched south through the Flathead Valley, finally stopping near present day Polson. When a glacier moves, a gap opens at its head, between the glacier and the rock behind and beneath it. Fresh snow and water fill the gap and freeze both to the newly exposed rock and to the moving glacier. As this new ice moves, rocks and boulders are pulled along, leaving steep, sheer walls behind. The North Fork Valley was entirely filled with ice both during the Bull Lake Ice Age and again, 15,000 years ago, when the entire operation repeated itself during the Pinedale Ice Age. The sheer, steep walls of the surrounding mountains are evidence of the icy, violent forces that created them. The broad U shape of the valley is a signature of glaciers too. As the giant ice sheets melted, these valleys opened up and glacial moraines and boulders appeared, silent relics of the past. From the canoe, the valley seems too perfectly formed for such seemingly random events. A lack of free oxygen made rocks green over a billion years ago. An abundance made them red. The inexorable grinding of plate tectonics moved them here where they sat for millions of years until the air cooled and warm rains changed to snow. For a hundred thousand years, ice sheets moved up and down the valley, carving cirques, horns, and arêtes. I understand only the rudiments of geology, but in truth, they’re all I need to know. I palm a red and white rock. It is warm from the sun and it radiates heat to my hand. I sidearm it across the river and it skips several times before sinking beneath a growing ripple. Here, in the river, surrounded by a billion years of movement, by violent forces and time beyond reckoning, science loses its appeal. I care less about the terminology and the physics that painted these rocks and carved these mountains. Instead I am captivated simply by their presence. There is magic in these rocks that can never be contained by science. I pick up a green one and slide it into my pocket. Like being in love, I want this feeling to last forever.